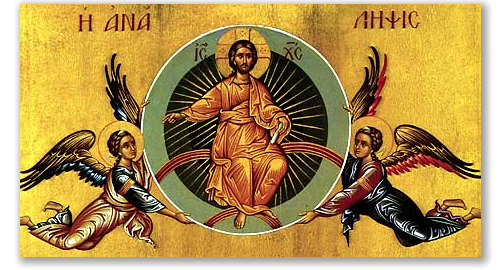 The Divine Liturgy for the Ascension of Our Lord and Savior Jesus Christ will be held on Ascension Eve, Wednesday, June 8 at 6:30pm. The story of the Ascension of our Lord, celebrated as one of the Twelve Great Feasts of the Church, is found in the book of the Acts of the Apostles 1:3-11. It is also mentioned in the Gospels of Mark (16:19) and Luke (24:50-53). The moment of the Ascension is told in one sentence: “He was lifted up before their eyes in a cloud which took Him from their sight” (Acts 1:9). Christ made His last appearance on earth, forty days after His Resurrection from the dead. The Acts of the Apostles states that the disciples were in Jerusalem. Jesus appeared before them and commanded them not to depart from Jerusalem, but to wait for the “Promise of the Father”. He stated, “You shall be baptized with the Holy Spirit not many days from now” (Acts 1:5). After Jesus gave these instructions, He led the disciples to the Mount of Olives. Here, He commissioned them to be His witnesses “in Jerusalem, and in all Judea and Samaria, and to the end of the earth” (Acts 1:8). It is also at this time that the disciples were directed by Christ to “go and make disciples of all nations, baptizing them in the name of the Father and the Son and the Holy Spirit” (Matthew 28:19). Jesus also told them that He would be with them always, “even to the end of the world” (Matthew 28:20). As the disciples watched, Jesus lifted up His hands, blessed them, and then was taken up out of their sight (Luke 24:51; Acts 1:9). Two angels appeared to them and asked them why they were gazing into heaven. Then one of the angels said, “This same Jesus, which is taken up from you into heaven, shall so come in like manner as you have seen Him going into heaven” (Acts 1:11). From Fr. 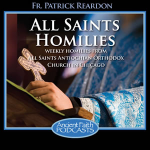 Patrick Henry Reardon on Ancient Faith Radio.